Drying mint by hanging it up for natural air-drying is something not all of us have the space for, but another method offers good results. You can use your oven to make dried mint in much less time. Here's how to do it. Wash the mint thoroughly and carefully in cold water without removing the stems. Dry the mint well using paper towels or other absorbent towels. Carefully remove the leaves from the stems when the mint is dry. Place the leaves on a cookie sheet in a single layer. Warm them in the oven at 180 F or 80 C for two hours, then check them to see if they've dried out completely. If so, they're done. Otherwise, continue checking them at 15-minute intervals so they don't burn. It can take as long as four hours for them to dry completely. 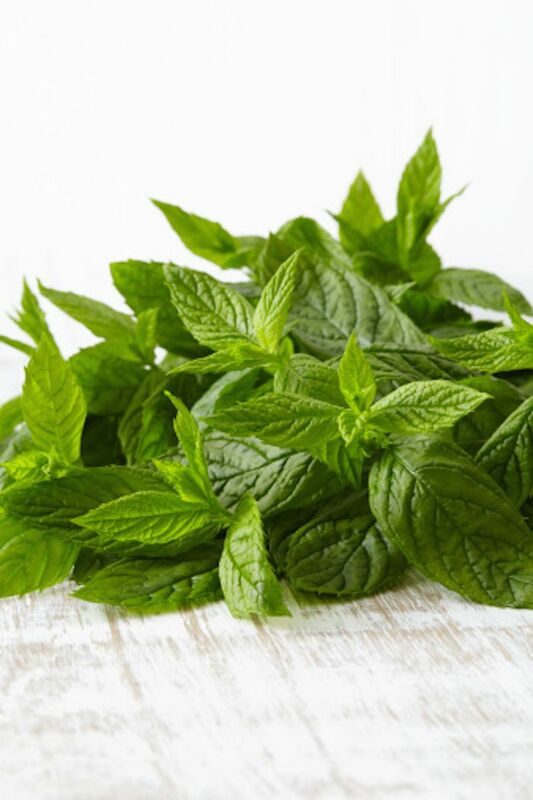 Store the dried mint in an airtight glass, plastic, metal or ceramic container away from light and heat. You can easily grow your own mint if you'd like an ongoing supply. Buy a mint plant and replant it in a much larger pot. Place the pot in a sunny place and make sure the plant gets plenty of water, watering it at least once — if not twice — a day so the soil stays nicely damp. When the plant grows and flourishes, cut off one or more sprigs and place them in a glass of water until they grow roots. This will probably take at least a week. Now plant the rooted sprig or sprigs in their own pots. It's recommended that you repot your plants at least once a year because these plants really like to grow and they'll need more room as they do. Pluck off the leaves you need for tea or a recipe and dry them. If you do this regularly, you'll have a never-ending supply. If there's any doubt as to whether the washed mint is really dry before you place it in the oven, err on the side of caution and pat it dry again. Better yet, pat it dry then wait a while until you can be sure all the moisture has evaporated. Putting it in the oven while it's still damp will cause it to lose its taste and aroma. Don't use a porous substance such as a paper or cardboard storage container because the material it will leach and absorb the mint's aromatic oils. Check the containers for any signs of moisture in the days immediately after drying and storing the mint. If you detect again, dry the mint again. Moisture can cause mold. The mint can be crumbled by hand or through a screen when it's very dry, or the leaves can be left whole. Steep about one teaspoon of the dried mint leaves in hot water for three minutes to make a soothing tea.